Apr.06.2018FTI Performance Partners with Frank Hawley’s Drag Racing School! 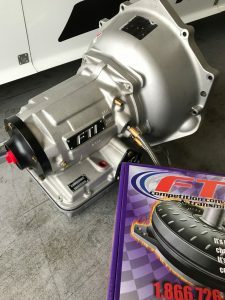 Starting this year the school partnered with Greg Samuel and his transmission and torque converter company, FTI Performance. “We have been running the FTI products and I’m amazed at the performance and durability. I’ve been to Greg’s shop and seen the attention to detail and craftsmanship that goes into his products. It’s a first class operation,” said Hawley. Since 1992, Greg Samuels and his wife, Phaedra, have supplied some of the best built transmissions in the country to some of the best racers in the country. A bracket racer since he was 17, Greg is not only a marketing partner for the school, but a transmission consultant as well. 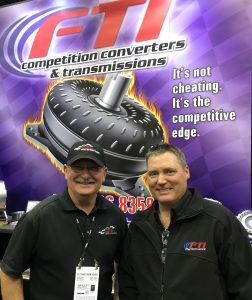 FTI is quickly becoming the standard in the performance industry with their innovative state-of-the-art torque converter and transmission design. The FTI Performance R&D team produces new products on a daily basis from Stock to Top Sportsman, from Street to Pro Mod. Their attention to detail and forward thinking sets them apart from all other manufacturers. With the latest technology and design available nowhere else, it’s clear to see why people are winning races everywhere in all categories of racing with FTI. A racer with a storied background, Samuel traveled the country from the early 90s to 2001, finishing his weekends quite often in the Winners Circle. As a racer, earning the trophy at the end of the weekend was the goal. Now, Greg prefers to see his customers go home with the gold. It’s more rewarding for me to show up at the race track and my customers win or go fast now than driving a car myself,” said Samuel. “I also enjoy helping racers get started and that’s why we are excited to work with Frank Hawley. It’s going to be a great partnership,” said Samuel. Frank Hawley’s Drag Racing School is the leader in Drag Racing School Instruction world wide. For over 3 decades Hawley’s School has been training the top professional and sportsman drivers. The School’s reputation has been built on providing the best instruction for its drivers as well as the best equipment in which to train. “It’s important for us to provide fast and reliable cars for our students to drive”, said Hawley. “We literally make thousands of runs each year which puts demands on our cars, especially the drive line. That’s why we are excited to announce our partnership with FTI Performance,” continued Hawley. For information on all the programs, class locations and class dates at Frank Hawley’s Drag Racing School, please visit our website at www.frankhawley.com. Feel free to contact us at 866-480-7223.